Bottom line: Apple's new iPad Pro is slimmer, more powerful, and has a bigger screen than last year's models. 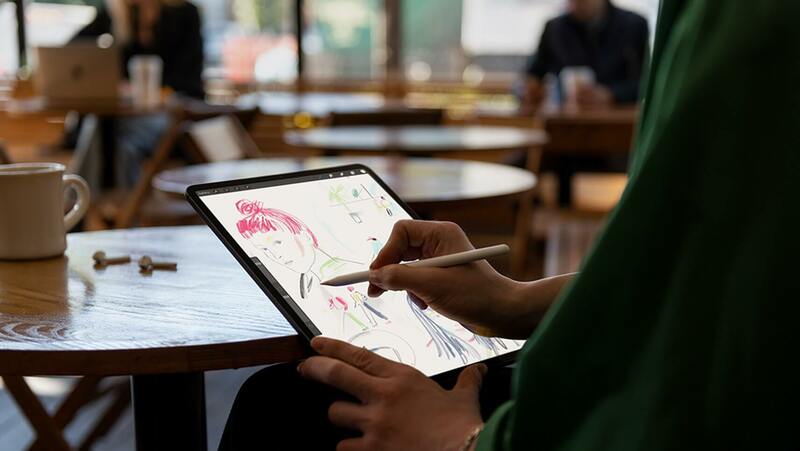 Cupertino claims that graphically, the iPad Pro is now just as capable as an Xbox One S.
Apple unveiled its 2018 iPad Pro at an event in Brooklyn, New York on Tuesday. The tablet has improved upon last year's model in several significant ways. The most noticeable change is the shape of the new iPad. Gone are the rounded edges. The design is reminiscent of the old iPhone 5 — rounded corners, flat back, flat edges. The new form factor also trims one millimeter off the thickness, bring it down to 5.9mm, while retaining the same footprint. Although it is the same length and width as its previous iteration, the 2018 iPad’s screen is half an inch bigger at 11 inches. This is due to smaller bezels and the elimination of the Home button. There is also a larger 12.9-inch model, which has a much smaller footprint than last year's 12.9 thanks to the same reductions in the borders. However, the bezels are still big enough to house the camera and facial recognition sensors without needing a notch. The new iPads will bring several iPhone X features to the platform including Face ID, Animoji, and Memoji. If you enjoyed the convenience of logging into things like your banking app with Touch ID, you will still be able to auto log, you’ll just be using Face ID instead. Under the hood, the 2018 iPad Pro sports a new 7nm A12X Bionic chip. It's a 10-billion transistor SoC with an 8-core CPU and 7-core GPU. The CPU is 35-percent faster than last year's model and 90-percent faster for multicore processing. Apple claims that with the 7-core GPU, graphical performance in the new iPad is on par with that of the Xbox One S. Even with the massive jump in processing power, the tablets still boast a 10-hour battery, just like last year’s models. Storage capacity has doubled as well. You’ll be able to get up to 1TB if you want to pay the premium for it. They also swapped out the lightning port for USB-C. You can even charge your iPhone or other USB-C devices using your iPad Pro as a makeshift portable battery pack. The new iPads will be complemented by the Apple Pencil and a new Smart Keyboard Folio. The second generation Pencil pairs with the iPad and has wireless charging. It also magnetically clips to the side of the iPad Pro. The Keyboard Folio is a new accessory that adds keyboard functionality to the iPad Pro but also acts as a cover protecting the front and the back of the chassis. The 11-inch iPad Pro will start at $799, while the 12.9-inch will run $999 and up depending on your configuration. Both models go on sale November 7 and you can pre-order one direct from Apple.